We often come across the term noise in photography. Noise is the random colored specs that usually dot the photograph when the film is underexposed. In digital photography they are the colored and often dark black pixilated spots which appear across the picture, when you have shot the image in low light. Noise is generally more evident when shooting images in low light and with higher ISO settings, especially with cameras which have a smaller sensor and no special low light correction features. Any digital signal (and that includes shortwave, light and other transmissions) will always carry noise with it. It is more evident when the light or the sound signal is poor in comparison with the noise. Many other reasons can be attributed to it including flaws in the design of the camera sensor (within an allowed tolerance), less amount of light that enters the camera which makes the signal to noise ratio in favor of noise and the amplification of the noise when the camera is set to higher ISO to counter low light conditions. There is a distinct relation between the size of the sensor and that of noise. Smaller the sensor size lesser is its ability to capture light, consequently more is the noise. Smaller sensors also have a higher concentration of pixels (or light capturing photodiodes). Smaller micro four thirds or 1/2.3 sized sensors or even the 1” sensor sizes (Nikon 1 series cameras) have a significantly smaller sensor size compared to an APS-C (Canon 60D) or a full frame sensor (Canon 5D Mark III). Yet, they have 14, 16 or even higher megapixels in that same space which translates to very small sized pixels. Smaller the pixel size, less light it can capture and as a result more is the noise. Correcting digital noise – One of the primary reasons why noise appears is when the ratio of signal to noise rises in favor of the noise. When shooing images in low light if the camera is set to Auto mode, it automatically corrects the shutter speed and the ISO to adjust for the absence of light. Modern professional full frame DSLRs have better low light sensitivity which captures more of the signal and increases the ratio of signal to noise ratio in favor of the signal. This improves the overall performance and reduces noise. 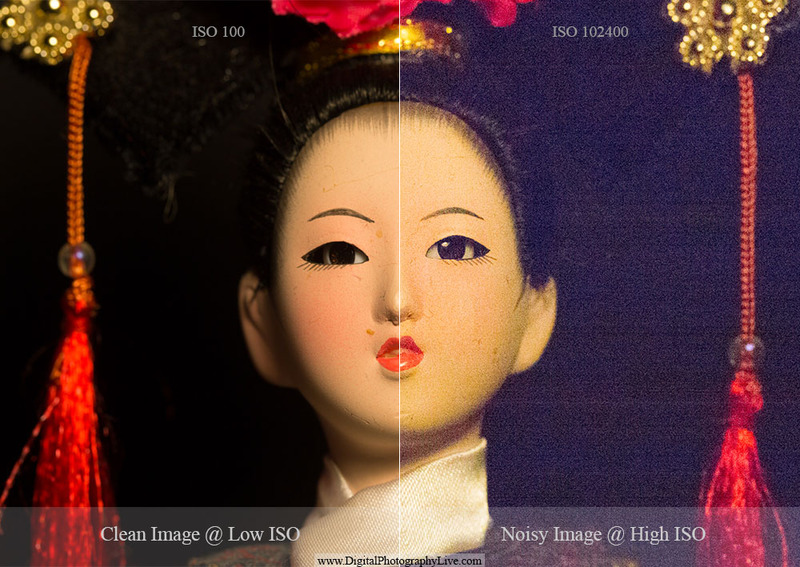 Leading camera manufacturers such as Canon and Nikon has introduced their latest image processing engines DIGIC 5 and EXPEED 2 respectively which ensures reduced noise, faster image processing and overall better quality pictures. These state of the art image processing systems can process more information from the available light. Conversely compact point and shoot cameras have been introduced with back-illuminated technology (Canon HS systems) which allows more light to be gathered by the sensor, reducing noise and increasing the quality of the pictures. Increasing the amount of light can also help. In low light conditions a professional photographer can use the built in pop-up flash of the DSLR or even an external flash-gun mounted on the hot-shoe to fill the frame. If it is at all possible, additional light sources can be used. However where there are no such options and the built in flash is simply not too powerful, one has to opt for higher ISO or slow down the shutter speed or use a wider aperture to let in more light.